Do you know a future Jayhawk who’s old enough to begin learning their alphabet and numbers? The university’s well-known mascot, the Jayhawk, guides the child reader through the book, teaching numbers, letters, colors, and points of interest about KU. For example, “A” is for Allen Fieldhouse, KU’s legendary basketball arena. “B” is for Blue, one of the school colors, and “L” is for Lawrence, the Jayhawks’ hometown. In addition to colorful characters and interesting facts, the book features an interactive push button that plays short audio clips of the KU Fight Song, the famous Rock-Chalk chant, and other well-known themes associated with the University of Kansas. Kansas Jayhawks ABCs and 1-2-3s follows in the tradition of KU books from Ascend Books of Overland Park, Kansas., including “At Home in the Phog,” by Coach Bill Self; “A Good Place to Stop,” by broadcaster Max Falkenstien; “Rising to New Heights,” by former KU quarterback Todd Reesing; and “Reed All About It,” by Tyrel Reed, KU Basketball’s winningest player. The book is richly designed by Kansas artist Rob Peters. 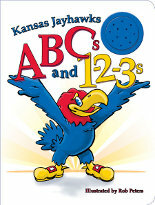 Endorsed by early childhood development specialists, Kansas Jayhawks ABCs and 1-2-3s is a wonderful addition to any child’s library, as a birthday gift, for baby showers, for Christmas, Hanukkah, or “just because.” Kansas Jayhawks ABCs and 1-2-3s is an officially licensed book of The University of Kansas. Rob Peters is a freelance illustrator living in Topeka, Kansas. He has a degree in Visual Communications from Judson College in Elgin, IL. Other works by Rob Peters include: Bluey & Dingo’s Outback Adventure by Thomas Burton and Geo the Green Hippo by Denise Olson.